Magnificent, but standstill in time, the silent city stretches on the slope of the strange hill with the imposing castle on top. Mystras! The Byzantine castle-city! The last cradle of the Byzantine Empire! A vast open-air museum in the heart of Laconia, at a short distance from the capital city of Sparta! Time has stopped in this hill, but Mystras still lives in the historic memory; with its palaces and churches, with its mansions and houses, with its gates and fortifications, with its streets and fountains. The long restoration and preservation work keep over time this historic treasure, which is admirable in thousands of visitors and offers precious knowledge on the development, culture and art during the last two centuries of Byzantium. 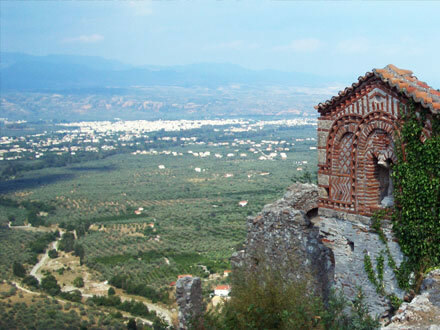 Mystras is on the UNESCO list of monuments of world cultural heritage. Come, walk with us in this remarkable silent city and get to know its monuments and history. 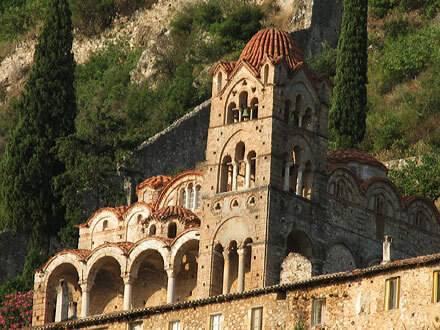 Mystras is located just five km west of Sparta, capital of Laconia. The archaeological area stretches on the slopes of a hill with a height at 633 m, on the eastern foot of Mount Taygetos. In front of Mystras is Neos (New) Mystras, a picturesque settlement with traditional colors and taverns. 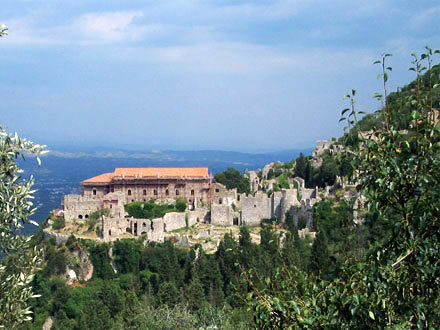 Mystras is a popular destination for day excursions. Sparta is 225 km from Athens. We can come to Mystras from anywhere we are on holiday in Laconia. Gythio is 46 km from Sparta and Monemvasia 92 km. In Sparta there are hotels so we can have plenty of time for our tour at the castle-city. The history of Mystras began in the mid-13th century, a time when the Franks dominated in the Peloponnese. 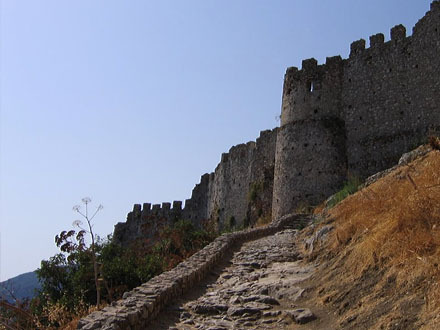 In 1249 the Prince of Achaia Guillaume Villardouine the 2nd built a strong castle on the hilltop with the name Mystras or Myzethras (which is the name of a Greek cheese in round form). Ten years later he was defeated and taken prisoner by the Emperor Michael Palaeologos and in return for his freedom ceded the castles of Mystras, Monemvasia and Maini. In 1262 the castle of Mystras became the seat of a Byzantine general. Feeling safer, the residents of the neighboring Lakedaemonia, as Sparta was then called, began to build their homes on the slope near the castle. Thus, a settlement was created. It was named Chora and protected by a wall. Other houses were built on the outside and a new settlement was developed, also protected by a wall. It was named Kato (Lower) Chora, so the other was called Ano (Upper) Chora. 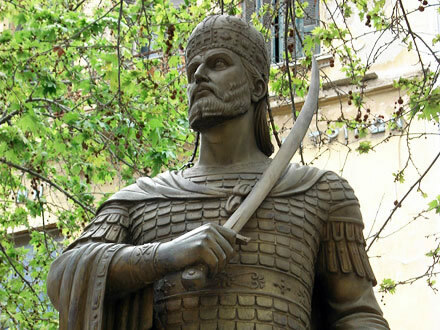 Since 1308 the Byzantine generals were permanent commanders. At the same time the seat of the Bishopric was transferred from Lakedaimonia in Mystras. 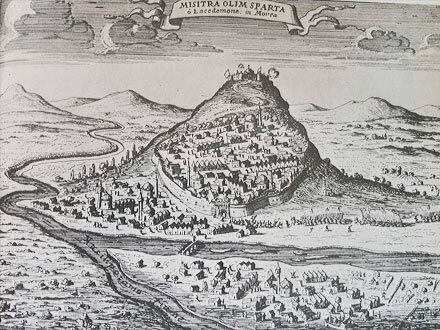 In 1348 the Despotate of Moreas was founded and Mystras became the capital of the Peloponnese with permanent lord named Despot. First despot was Manuel, second son of Emperor John Kantakouzenos; second, Matthew in 1380. Then the turn of the family Palaeologos came. Theodore the 1st, the son of Emperor John Palaeologos, became despot. He was succeeded in 1407 by Theodore the 2nd and in 1443 by Konstantinos Palaeologos. At the time of the Palaeologos dynasty, Mystras reached its peak. It experienced days of glory having under its authority throughout the Peloponnese and became the center of political and intellectual life of the empire. Culture and arts flourished. In 1410 the philosopher George Plethon Gemistos came as judge and adviser of despots and founded its famous philosophical school. On January 6, 1449 at the church of Aghios Demetrius, Cathedral of Mystras, Konstantinos Palaeologos was crowned emperor of Byzantium and left for Constantinople for death and glory in the conquest of the city by the Turks in 1453. Mystras was the last free area of the empire until 1468, when the despot Demetrius, Constantine's successor, handed without a fight the castle to Mohammed the 2nd. 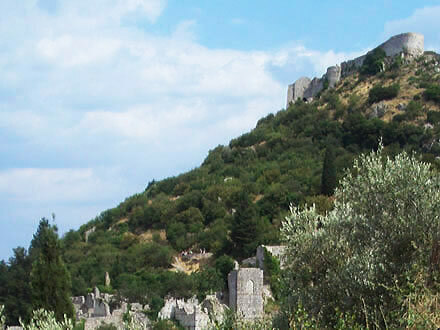 Mystras became the seat of the Turkish commander and remained thriving. It produced silk and had great commercial activity. In 1687 was conquered by the Venetians, but in 1715 the Turks returned. At the time Mystras had 42,000 residents. After the Greek uprising in 1770, the time of the Russo-Turkish War (1768 – 1774), were only 8,000 residents. Mystras participated from the beginning in the Greek Revolution of 1821, but in 1825 the Egyptians of Ibrahim Pasha burned the Lower Chora and the residents began to leave. Others settled lower in the village of Neos Mystras; and others returned to the banks of the river Eurotas to create the new Sparta, where after 1830 the authorities also were transferred. In the Byzantine city the abandonment gave way to the ravages of time. Mystras is totally an outdoor museum, tangible evidence of a glorious era of power and culture, a source of knowledge about life and culture in the last period of the Byzantine Empire. The years that empire fell into decline, Mystras was its most flourishing center. The tour in the silent state is a charming walk in the past and an acquaintance with the architecture and art of those years, especially painting, as expressed in the magnificent frescoes of churches that have been rescued, restored and preserved. From Sparta we reach the village Neos Mystras. In the village square, as we stare on the hillside the first images of the castle-city, we stand in front of the statue of Constantine Palaeologos, despot of Mystras and last emperor of Byzantium. The road ends near the gate of the outer wall, fortified with a tower. It is the entrance to the Byzantine city. The outer wall was built last to protect Lower Chora. Higher is the inner wall, built to protect Upper Chora with the first inhabitants below the castle. Both fortifications have square towers. 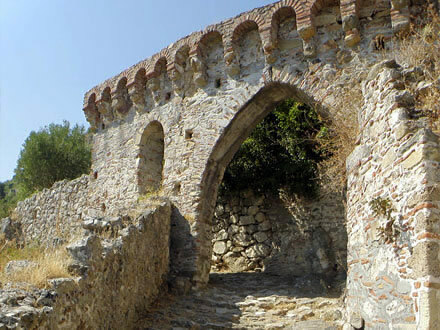 Mystras had three entrances. The main entrance was the today entrance in the outer wall. High, at the northern part of the inner wall, was the Gate of Nafplion with an iron door that rose and fell and fortified with square and round towers. The third entrance was the Upper Gate or Gate of the Castle. The Lower Chora and the Upper Chora communicated through the Gate of Monemvasia or Sideroporta (Iron Gate) in the inner wall. Going up the winding streets of Mystras with the ruins of the mansions and homes you think that a world that's gone is waiting behind every corner of the silent city. In the inner wall the Gate of Monemvasia leads to the Upper Chora. A square stretches in front of a complex of buildings. The Palaces of the despots of Moreas! The Square of Upper Chora was the place of official events at the time of glory, and the bazaar during the Ottoman years, a time of flourishing commercial life of Mystras. The Palaces, built on a rocky base, form an impressive complex of buildings, which dominates over Mystras. Were built at different times and have been restored. The first building is the palace of Kantakouzenos, the first dynasty that ruled Mystras. Perhaps was a Frankish construction. In the same period belongs the second building. The third four storey building was built in 1350 to 1400. At the same time built the fourth two-storey building where the despot lived. The fifth building, built after 1400, is the Palace of Palaeologos, the second dynasty of Mystras. It has a length of 38 m and a width of 12 m. The first floor was for the services of the Despotate. The second was the throne room. High at the top of the rock is the Castle, built by the Franks in 1249. In the following years many repairs and additions were made. It has two enclosures with one gate each. In the outer enclosure are distinguished a powerful round tower, a cistern and remains of Ottoman constructions. In the inner enclosure are the deserted house of the governor, a cistern, a round tower and a chapel perhaps the oldest building of Mystras. The history as well as the daily life of Mystras over the centuries also emerges from the mansions and homes. Older and newer, the most have retained their original form constituting a source of knowledge about the architecture and the way of construction, but also the habits of life. Most important, preserved in better condition, are the mansion of Lascaris near the gate Marmara and the mansion of Frangopoulos between the churches Perivleptos and Pantanassa; also the Palataki (Little Palace), as is called the mansion near the church of Aghios Nickolaos in the Upper Chora; the various phases of its construction date from the 13th to early 15th century. 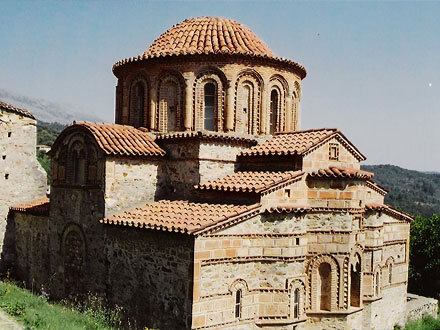 More than twenty-five are the churches which add their architectural and historical significance to the particular character of Mystras. Others with more and others with less marks as time passed. Some are known only by their position. Seven churches stand out. They are greater and better preserved, with distinctive architecture and beautiful frescoes. Agios Dimitrios (St. Demetrius) is located in the north side, near the fortified gate-entry into the castle-city. Is the Metropolis (Cathedral) of Mystras. It was founded shortly after the concession of the castle by the Franks to the Byzantines. In the 15th century, significant changes were made. The result is a synthesis of a three aisled basilica on the underside and a cruciform church with five domes on top. The cleaning and maintenance revealed frescoes showing the artistic blossoming in Mystras until early 14th century, with the exception of the dome, which probably belongs to the first half of the 15th century. It is estimated that ten artists worked on the decoration. A marble plaque with the coat of arms of the Palaeologos family, the double-headed eagle, reminds the coronation of the last emperor of Byzantium held here in 1449. 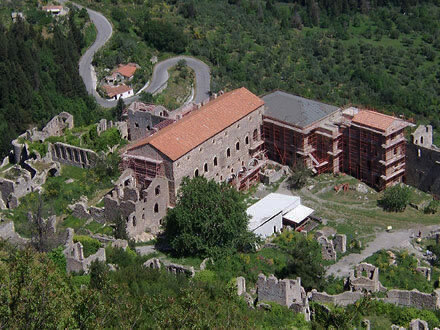 Agios Dimitrios houses the Byzantine Museum of Mystras. Among the exhibits are paintings, icons, sculptures and inscriptions from the site of the city. Near the Cathedral, on the north side, in the cemetery area, is Evangelistria (Annunciation), a small church with very interesting architecture and important sculpture decoration. Probably was built in the late 14th century. The church of Pantanassa is located on the eastern side of the hill, in the inner wall near the Gate of Monemvasia. 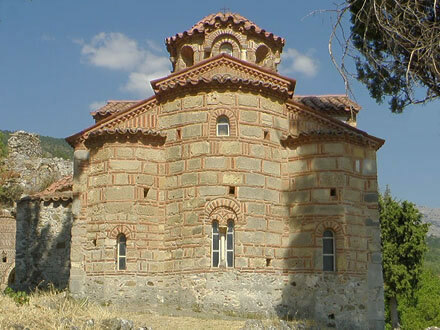 It is the newest church of Mystras and has the most complex form. It was built in 1428 and in architecture and decoration, except the elements of Mystras and Constantinople, are distinguished influences from Western art. It has five domes and the ground floor of the four-storey bell tower is a chapel. The northern of its galleries has a dome. It is the only preserved intact in Mystras. Inside, the painted decoration on the lower surfaces belongs to the late 17th and early 18th century. The original frescoes are preserved on the upper surfaces and are considered as the last representative work of Byzantine art. Aghia Sophia is located near the Palaces of Despots. 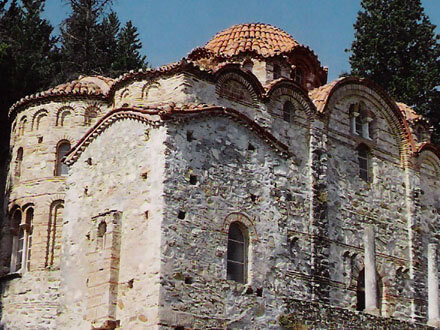 It was the church of the monastery of Zoodotou and built in 1350 by the first despot of Mystras Manuel Kantakouzenos. It is two-columned cruciform with a dome. It has narthex, gallery, chapels and three-storey belfry. With the restoration work largely regained its original form. The paintings belong to the second period of Mystras art after 1350. The richest monastery of Mystras, with many privileges, was the Monastery of Vrontochiou on the northern side of the outer fortification. It had its own wall and was the center of spiritual life with a large library. Here despots were buried. There are two churches, Aghii Theodori (Saints Theodore) and Panagia (Virgin) Odigitria. The church of St. Theodore was built in 1290 – 1296 and is octagonal as Daphni and Hossios Loukas, which are monuments of cultural heritage of UNESCO. It is one of the most beautiful churches. It has different levels on the roof and the wall paintings are characteristic of the first period of Mystras art. In the four corners are chapels, where probably were tombs of senior officials or members of the aristocracy. The church of Panagia Odigitria reminds the architecture of Constantinople. It is also called Boss; or because the monastery was administratively independent and reported directly to the Patriarch or because the despot Theodore the 2nd of Palaeologos was buried here (despot > afendis (effendi) > master>boss). 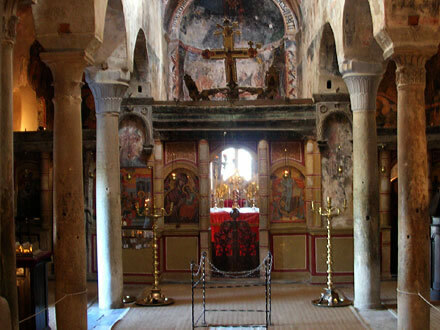 The church was founded in 1310 and is the first of complex form in Mystras, a three aisled basilica on the underside and four-columned cruciform with five domes on top. It was restored from 1934 onwards. Very important is the painting decoration revealed by maintenance work. It seems that three or four painters from Constantinople worked together creating beautiful murals like mosaics. Particular significance for the art of painting of Mystras, have the murals in the four chapels surrounding with arcades the church. In the northwestern chapel, with magnificent frescoes, are the tombs of Theodore the 1st of Palaeologos and Archimandrite Pachomius, founder of the church and great ecclesiastical personality. In the southern chapel are the tombs of the nobles. And in the southwestern chapel are inscribed on the walls the imperial chryssovoula (golden bulls) with the privileges of the monastery; the oldest edict is of 1312 and the newest of 1322. On the opposite side of the monastery of Vrontochiou, in the southeastern corner of the outer wall, is Perivleptos (meaning “seen from all around”). Small monastery built in the mid-14th century at the base of a cliff. The church of Panagia of Perivleptou took its name from the famous church of Constantinople. It is two-columned cruciform with a dome, much like the churches of Evangelistria and Aghia Sophia. There are also three chapels; Aghios Pandeleimon and Aghia Paraskevi on the east side and Aghia Aekaterini (Catherine) on the west side in the rock. Particularly important are the frescoes from the second artistic period of Mystras. 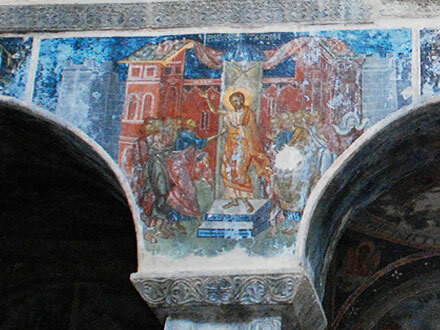 The dome is actually the only one in Mystras in which the painting is kept intact. Of its exquisite frescoes the Heavenly or Angelic Liturgy is considered as one of the masterpieces of religious art. Of the other churches of special interest are Aghios Christophoros near Marmara, St. George near Perivleptos, Aghii Taxiarches (the Holy Archangels) and Aghia Anna towards Pantanassa, and Agia Paraskevi in ​​Upper Chora; interesting are also the post-Byzantine Aghios Nickolaos (St. Nicholas), and Aghios Ioannis (St. John) outside the walls.